My name is Hank. I’ll be your bartender for tonight. What will it be? Don’t tell me. I know exactly what you want to drink. So, what’s on your mind? You have a story to tell? You’ve come to the right place. I’ve got some interesting stories as well. Have you heard the one about the ghost who walked in the bar? The one who kept coming back, waiting for the arrival of that certain someone? What about the guy who had coffee with his dead girlfriend? Or the story of the spectral Christmas carolers? And then there’s that strange tale of all those senior citizens who watched the last full show and never came out. No? Haven’t heard those? Well, have another drink and I’ll tell you all about it. 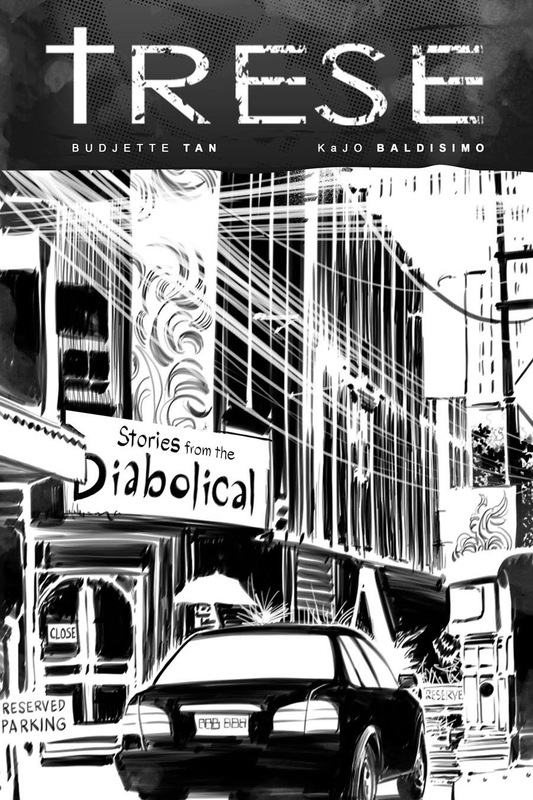 A collection of short illustrated dark fantasy stories narrated by Hank the bartender of Alexandra Trese’s club in Malate, Manila, Stories from the Diabolical helps tide Trese fans over until the next graphic novel installment. For those not familiar with the series, Trese is a detective specializing in solving cases involving supernatural creatures. She has a crucial role in keeping the balance between humanity and the Underworld, even possibly in tilting it to one or the other. She has two bodyguards, twin young men, the Kambal, who are the sons of a god of war. The series ties in with Filipino mythology for a unique take on dark urban fantasy. According to the authors, Hank somehow always gets edited out of the graphic novels. He is supposed to be Alfred to Trese’s Batman. So, they decided to give him his own series, where he stars as this guy with all the fantastic stories and wise advice. Through his stories readers get a chance to see what Trese is up to when she is not consulting with the cops. We also get a more intimate feel of Manila’s ghostly side as the bar acts as an intersection for all sorts of human and non-human lives, sometimes sad or scary, other times hopeful. The first story, One Last Drink at the Diabolical, is a prelude to the Trese series. The team is in the bar as a fight almost breaks out between a fire-wielding man (possibly a fire elemental) and mermaids. The tone is light-hearted what with the Kambal giggling like crazy. Well, I’m glad for their bit of fun because the night will soon bring them the case of the Murder on Balete Drive (volume 1). The other three stories are more like ghost stories rather than urban fantasy, where the shaded black-and-white illustrations flow seamlessly with the text. To be honest I find this kind of book a little odd. It’s not a graphic novel yet it has big-font text laid out on generously illustrated pages, looking a bit like a middle-grade book at first glance. But perhaps I am not as familiar with the range of books out there as I think I am. In any case, I enjoyed this book. It’s a welcome breather from the fast-paced action of the Trese graphic novels. I don’t mind having drink or two again with Hank. In fact, the last time I was in Malate my friends and I looked for the Diabolical. We heard the fictional bar was inspired by a real-life bar and bartender. Click to read reviews of the TRESE graphic novels.